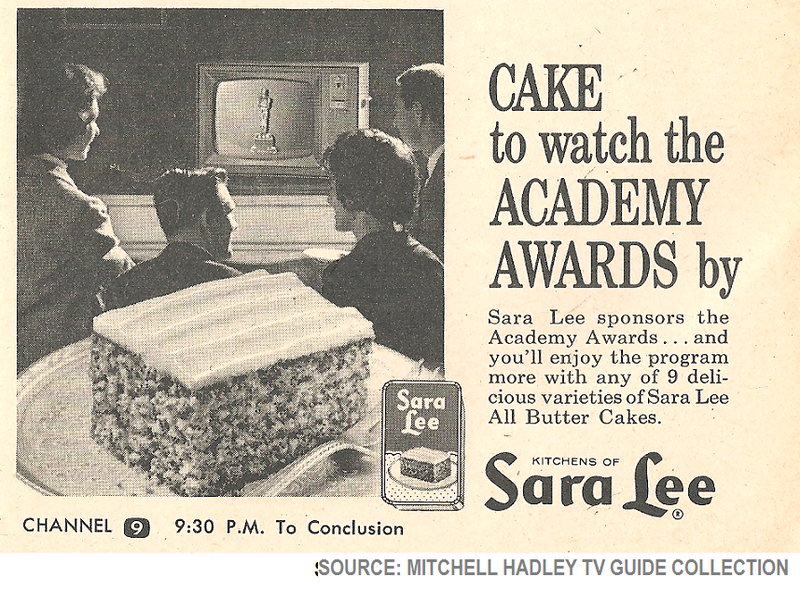 The Academy Awards were, once upon a time, must-see television. The show routinely drew the largest TV audience of the year, and the winners and losers would be debated for days afterward. Today, not so much. But with Oscar Sunday coming up this weekend, let's have some fun and look back at some of Oscar's television history. 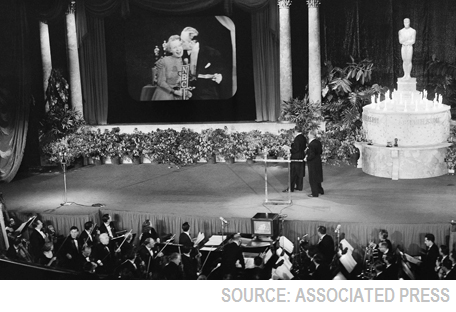 The picture at left is from the first Academy Awards telecast, on March 19, 1953. The idea of televising the Oscars was not a new one; portions of the show, including the major awards, had been broadcast on national radio for years, and as early as the late 40s there had been offers to televise it, but it wasn't until the movie studios withdrew their financial support from the awards show that the Academy cut a deal with NBC for $100,000 to broadcast the event. For the first few years the show was telecast from both Hollywood and New York, in order to accommodate the nominees acting in Broadway shows, with each venue sporting a giant screen so that attendees might see the winners on the other coast. Because of the harsh television lights, men's white tuxedo shirts were tinted blue, while women were urged to wear pale blues and grays. Mr. Oscar, Bob Hope, was the emcee from Hollywood, while actor Conrad Nagel did the honors in New York. 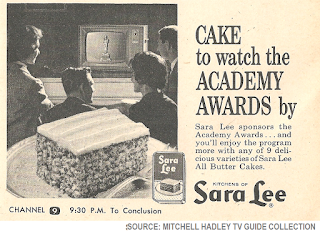 The 1958 telecast was sponsored by the Academy itself; with the result that the show was presented without commercial interruption. (Imagine that today!) 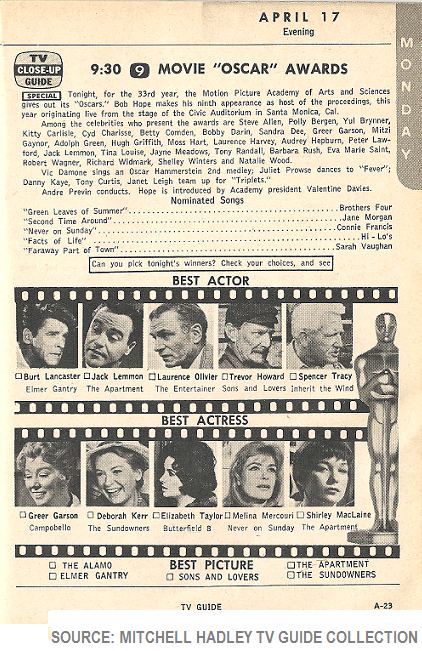 1958 was also the end of the bi-coastal broadcasts; from here on it, the Oscars would come live from Hollywood (or, later, Los Angeles). Jerry Lewis, who had hosted the show to great acclaim in 1957, returned as one of the six hosts in 1959*, and thus was the man on the spot for one of the more ignominious moments in Oscar history. Having wrapped up the show with Mitzi Gaynor singing "There's No Business Like Show Business," Lewis received a frantic signal from director Jerry Wald - there were still twenty minutes of air time left! The show actually ran short! Lewis vamped for a few minutes, the show degenerating into a kind of chaotic panic, before NBC pulled the plug and filled the remaining time with a short film. That show ran, if you can believe it, one hour and fifty minutes. *The other hosts were Bob Hope, David Niven, Tony Randall, Mort Sahl, and Laurence Olivier. And that wasn't terribly unusual. The initial Oscar shows regularly ran under two hours; the first one to top three hours was in 1957, but between 1958 and 1973 the average running time was 2:20, and as recently as 1972 the show had wrapped things up in a tidy 1:44. The turning point was in 1974, when the running time leapt to 3:22; it hasn't been under three hours since, and maxed out at 4:23 in 2002. Johnny Carson, when he was the host, once joked that it was time to look at the toteboard and see how much money they'd raised. More recent shows have manged to keep it down somewhat, running a little under 3½ hours. One of the reasons for the brevity of those earlier broadcasts might have been the starting time; the traditional broadcast time was 10:30 pm ET, requiring the network to only preempt a half-hour of regular programming. In Hollywood, a 7:30 PT start allowed for the traditional searchlight and flashbulb popping on the red carpet, and a two-hour broadcast would wrap up at 12:30 am Eastern, before midnight to the rest of the country. In 1963, with the ceremonies now being held in the Santa Monica Civic Auditorium, the start was moved up to 7:00 PT, and in 1980 it moved up another hour, to 6:00 PT, 9:00 ET. It meant the show was still finishing up around 12:30, but you had to sit through another hour or so to get to it. The traditional night for the Oscars was Monday, with rare forays into other nights. It was postponed for two days in 1968 in order to avoid conflicting with the funeral of Martin Luther King, Jr., and was delayed for a night in 1981 following the attempted assassination of Ronald Reagan, but otherwise remained on Monday until 1999*, when TV once again intervened and the ceremony was moved to Sunday, where it could start even earlier, and East Coast viewers stood a slim chance of getting to bed before midnight. And of course the show has been moved up on the calendar, from its traditional March-April dates to late February, in order to try and head off the other awards shows that have started to horn in on the prestige. *For many of those years in the 70s and 80s, the show went head-to-head with the NCAA basketball finals. One guess as to who won that battle. As for the networks presenting the show, while NBC carried the initial telecasts, the Oscars have been most frequently identified with ABC, which has presented the show since 1960, with a brief return to NBC between 1971-75. For better or worse, ABC continues to have the rights to the broadcast through 2020. The first color broadcast was in 1966; as Bob Hope said, "[F]or the first time, you can actually see the losers turn green." In 1967, a strike by AFTRA against ABC cast doubt that the show would be seen by anyone outside the Civic Auditorium; the Academy vowed, in the best tradition of entertainers, that "the show would go on" with or without TV, but fortunately the strike was settled a bare three hours before airtime. I don't watch the show anymore - I've gotten weary from the endless politicizing from the hosts, the presenters, the winners, and the movies themselves. And besides, it's just so damn boring. But I still enjoy looking through the archives, the TV Guides and the Inside Oscar books, and remembering the great Oscar winners of the past. Perhaps someday the program will be compelling enough to get me to return to the living room couch (well, that and a better time zone), but for now the memories will have to suffice. I still remember one Monday-night Oscar show that ran against the NCAAs - Elliott Gould and somebody else were presenting the awards, and when the other presenter intoned "And the winner is...", Gould leaned in and said "Indiana, 86-68." I remember that as well, Ray! I thought then that Gould was the only one there who really had his priorities in order! That was 1976. IIRC other years where it went head to head were 1981(scheduled) 1982 and 1987(In 1982 and 87 the basketball game game on the air at 7 PM CT and not 8 PM as it does today.) There were other years but I can't remember right off the top of my head. TV in your hand? You're kidding!